The problem this time was constantly changing wind direction. We started off in the SW bowl, then with just three flights short of three rounds, the wind swung round to the West. A move to Levisham followed and the third round restarted, but after only a few flights the wind promptly swung back 180 degrees. By this time it was getting late, so CD Jon Edison had no choice but to abandon - still short of the three rounds minimum. My thanks to Jon for all his hard work - at least we all had a good time in the sunshine. Let's hope for better luck at Whitesheet. Whoops, forget I wrote that! Conditions during the two rounds were something of a lottery, alternating between thermal, sink and turbulence. For what it's worth, the 1,2,3 were Zim, Kevin and myself. 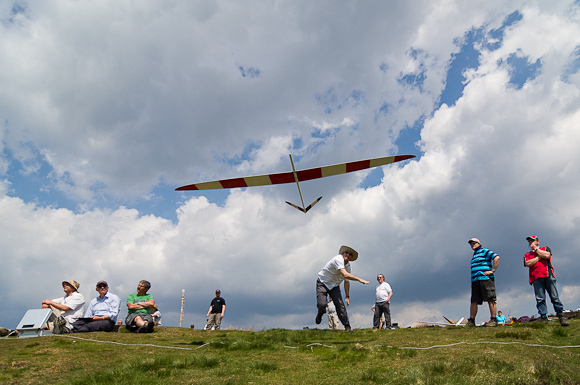 Mark Redsell flew the fastest time (low 40's). For the first time, I brought along a wide angle zoom and an external flash (a Metz 48). The idea was to get a bit more impact for the pilot shots, and to lighten the harsh shadows which always accompany a sunny day. Thanks to all for putting up with all the clicking and flashing!